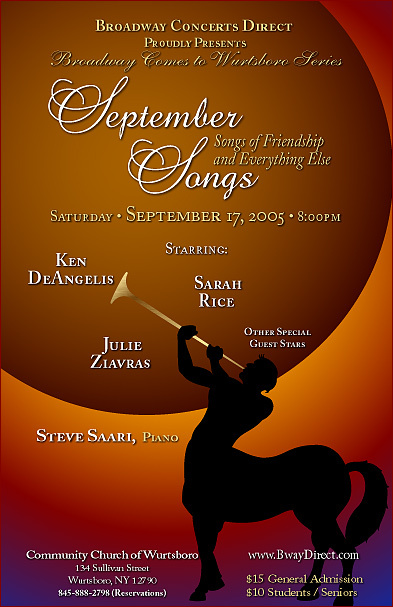 Soprano Julie Ziavras will present a varied and eclectic multi-genre recital program accompanied by the remarkable pianist/composer Steve Margoshes. Sung in six languages, the program includes classical song, operatic arias, operetta, Broadway, folk ballads and Greek song. Guest artists are Ada Margoshes and Ken DeAngelis. Free and open to the public. Come early to be ensured a seat. Call: 845-457-9867. Soprano Julie Ziavras will present a program of music from and about Spain to include Spanish art song, Renaissance song, Zarzuela arias (Spanish operetta) with works by De Falla, Montsalvatge, Rodrigo, Gerhard, Granados and Chapi. Featuring guest artists classical guitarist Simon Powis and pianist Steve Margoshes. There will be a special tribute to poet/composer Federico Garcia Lorca, featuring his settings of Spanish folk songs for guitar and voice and other composers' settings of his poetry, including composer Paula Mlyn and Greek composers Manos Hadjidakis and Mikis Theodorakis. Music at the historic Saint Alban's Church is an outreach program that brings affordable, high-caliber performances of classical music by international artists to Staten Island's South Shore. Tickets: $25, seniors/students $20. Reception to follow concert. For more information call 718-984-7756 or visit: wwwmusicatsaintalbans.org. Soprano Julie Ziavras will join the cast of Mostly Opera performing the final scene from Madame Butterfly. Mostly Opera presents "Rigoletto & Friends", excerpts from Verdi's Rigoletto, Bizet's Carmen, Mozarts' Cosi fan tutte and Massenet's Manon, under the musical direction of Linda Houck. A "Meet the Singers" reception follows the performance. Tickets $25, free parking. For reservations or information call: 570-346-3693. Soprano Julie Ziavras will sing the role of Kate in Cole Porter's musical comedy masterpiece Kiss Me Kate. The DVO 2012 season, inspired by the works of William Shakespeare, includes Kiss Me Kate which is based on Shakespeare's comedyThe Taming of the Shrew. An enduring favorite, it features some of the best loved melodies in American musical theatre and will be performed in English with orchestra. More information about the cast and performance locations to come. For more information call 845-252-3136 or visit: www.delawarevalleyopera.org. The Pike County Choral Society will present the world premiere of Ken DeAngelis’ original folk songs arranged for chorus by the internationally acclaimed composer and Artistic Director of the Pike County Choral Society Charles D. Osborne. Ken and Julie perform a solo set of Ken's originals, accompany the chorus with guitars and be joined by Mr. Osborne in folk song numbers. 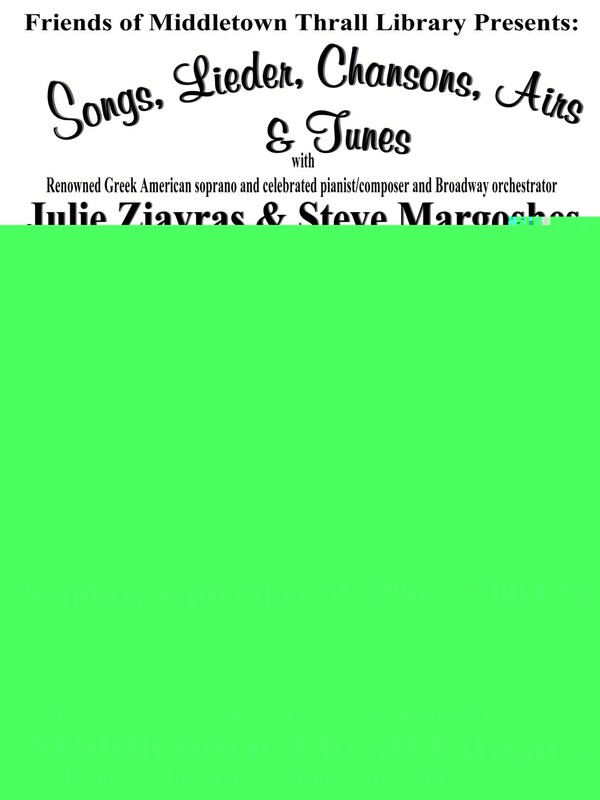 The Pike County Choral Society presents “A Musical Bouquet”, a spring concert in time for Mother’s Day, with special guest performers Ken DeAngelis and Julie Ziavras. The concert is a refreshing mix of old and new, with works by Randall Thompson, William Billings, C. Hubert Parry, Yehezkel Braun, Ken DeAngelis and Charles D. Osborne, accompanied by organist Henry Repp. Featured is a choral work entitled New England Season by Charles D. Osborne written to the poetry of Robert Frost. The concert will take place in this beautiful historic church which dates from 1871 in the heart of Milford, PA. Tickets are $10 and are available in advance or at the door. For more information or to purchase tickets, call 570-775-0963 or email: pccs.milford@gmail.com. 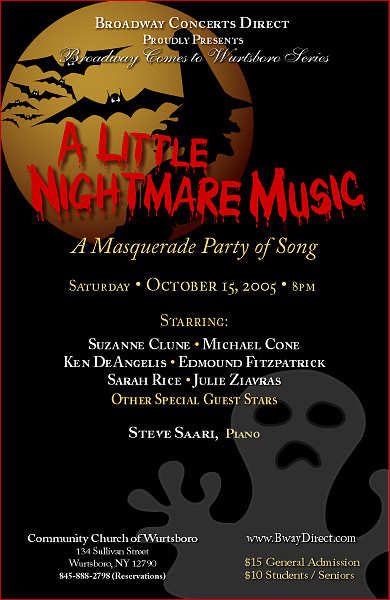 A classical recital with soprano Julie Ziavras, cellist Avram Coleman (NY Philharmonic) and pianist Gildo Di Nunzio (Assistant conductor at the Metropolitan Opera). Works including Handel, Massenet, Brahms and Rachmaninoff. Sponsored by the Historical Society of Warwick, Baird's Tavern is a stone tavern dating back to 1766 with guests including George Washington and is currently host to chamber music concerts throughout the winter months. Concert sponsored by the Warwick Historical Society, visit: www.warwickhistoricalsociety.org. Tickets $20, including artist reception. Limited seating, reservations recommended. For reservations contact Jo Hull: 845-986-3236 or email WHS@warwick.net. Soprano Julie Ziavras will sing the role of Violetta in a staged performance of the finale of Act II of La Traviata. Performance will include scenes from Gounod's Faust, Mozart's Don Giovanni and Verdi's Aida. Chamber ensemble accompanied by pianist/Musical Director Linda Houck and stage direction by Helene Tinsley. Tickets $15 general and $25 preferred seating (Opera Circle). Free parking. For reservations call: 570-346-3693. The Pike County Choral Society will feature soprano soloist Julie Ziavras singing Exsultate, jubilate K.165 and the soprano solos in The Requiem Mass in D minor (K. 165), conducted by Johanan Bickhardt and accompanied by organist Henry Repp. Soloists for the Requiem are soprano Julie Ziavras, tenor Marshall Cooper, alto Jennifer Ponzoni, baritone Charles Osborne. An all Mozart program, also featured are Mozart's “Ave Verum” and “Laudate Dominum,” with soloist Jennifer Ponzoni. Tickets $10 donation at the door. Call Lorna: 570-775-9436. Directions: http://www.merchantcircle.com/business/First.Presbyterian.Church.of.Milford.570-296-4711/map. Soprano Julie Ziavras, baritone John Cimino and pianist Judith Schaaf will present a Broadway-Opera Fusion, featuring songs, arias and duets including highlights from Man of La Mancha, West Side Story, La Traviata, Don Giovanni, Porgy & Bess and more. This concert is a fundraiser for the charitable organization Music For Humanity. Doors open at 7:00 pm for general admission seating, Silent Auction and Gift Basket raffle. Concert begins at 8:00 pm. Tickets $20 in advance, $25 at the door and $35 for reserved seating. Only 50 reserved seats available and 150 general admission seats. Tickets available online: http://musicforhumanity.org/musicians/members/57/event.php. You can also send a check to Music for Humanity, PO Box 359, Chester, NY 10918. For more information, contact Barry Adelman: 845-469-0900, Barry@MusicForHumanity.org or visit the Music For Humanity website. "Mass in the Time of War"
Julie Ziavras will be soprano soloist in Franz Joseph Haydn's "Mass in the Time of War" (Paukenmesse), in a concert with the Pike County Choral Society to honor our troups. The concert celebrates the 200-year anniversaries of the death of Haydn and the birth of Felix Mendelssohn, with three gems from his choral liturgy including from St. Paul Oratorio. The "Mass in the Time of War" soloists include soprano Julie Ziavras, mezzo soprano Julia Ravinsky, tenor Marshall Cooper, bass Colman Reaboi, directed by Rabbi Johanan Bickhardt. Also featured is Hubert Parry's "Jersusalem". "Tickets $10 donation at the door. Call Lorna: 570-775-9436. Carpenter Ave & 3rd St.
Julie Ziavras will perform a program of opera arias and duets with tenor Anthony Daino in a Summer Pops concert with the GNSO conducted by Marcus Parris. Featured are operatic arias and duets by Puccini, light classical music, American National songs and marches and percussion soloist Andy Csisack. In collaboration with the City of Newburgh, admission is free and the concert is open to the public. The environment is ideal for a picinic. In case of rain, the concert will be held at Aquainas Hall at Mount St. Mary College on Powell Ave in Newburgh. Julie Ziavras will sing the role of Mimi with the Delaware Valley Opera, with orchestra conducted by Music Director Dr. Jim Blanton. 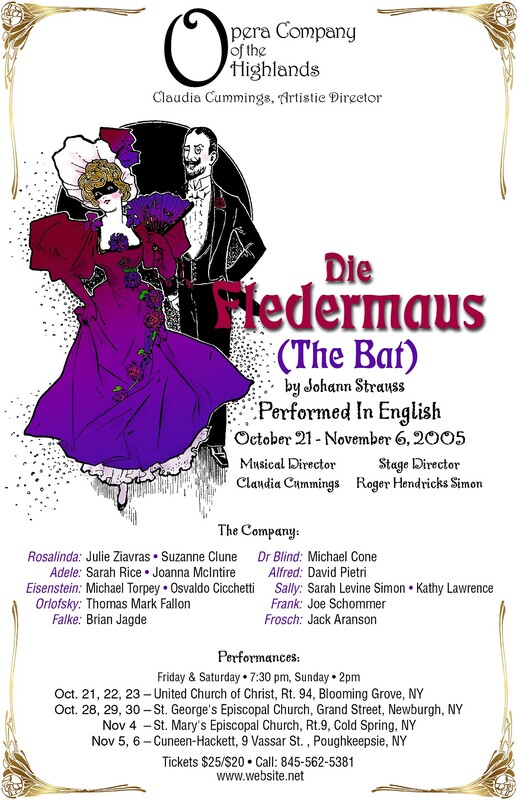 The cast includes Erik Sparks as Rodolfo, Jeanne Marie Lowell as Musetta, Mark Gargiulo as Marcello, Eric Barsness as Coline, Gustavo Morales as Schaunard and Johanan Bickhardt as Alcindoro. Performances August 1-16, 2009. Tickets $25/22/15, available through the Tusten Box Office (845) 252-7272. For further information visit www.dv-opera.org, email info@dv-opera.org or call: 845-252-7272. A Manhattan Camerata chamber orchestra ensemble concert featuring a unique mix of Early, Contemporary and World Music with works by Mozart, Piazzolla, Dowland, Dr. Pedro da Silva and Artistic Director Lucia Caruso and others. Soloists include vocal soloist Julie Ziavras, oboist Megan Marolf, pianist Lucia Caruso, Pedro da Silva, classical guitar and Portuguese Guitar and conductor Ramon Catalan. Tickets $20, students $10. Join us for a reception following the concert at Amber (221 Columbus Ave at 70th St.). Directions to concert: www.manhattancamerata.com/Upcoming_events.html. The Manhattan Camerata is an innovative orchestra whose repertoire mainly focuses on Early Music (Medieval, Renaissance, Baroque), Contemporary and World Music. Its eclectic style is a result of the diverse backgrounds of its founders; Lucia Caruso, composer and pianist from Argentina, Ramon Catalan, conductor and pianist from Chile and Dr. Pedro da Silva, composition faculty at NYU and instrumentalist (classical and Portuguese guitars, sitar, bouzouki, mandolin and lute), giving the Camerata an international and multi-cultural approach. 2018 Title Venue Links to more info. 2017 Title Venue Links to more info. 2016 Title Venue Links to more info. 2015 Title Venue Links to more info. Dec. 20 "A Dickens of a Christmas"
2014 Title Venue Links to more info. 2013 Title Venue Links to more info. May 5 Mostly Opera Co, "Love Stories"
2012 Title Venue Links to more info. July 20 & 28 Delaware Valley Opera "Kiss Me Kate"
2011 Title Venue Links to more info. 2010 Title Venue Links to more info. 2009 Title Venue Links to more info. 2008 Title Venue Links to more info. Dec. 5, 6 & 7 Humperdinck's "Hansel and Gretel"
2007 Title Venue Links to more info. 2006 Title Venue More info. 2005 Title Venue More info. Jan. 15 "Love Songs from Baroque to Broadway"
2004 Title Venue More info. Nov. 13 "Love Songs from Baroque to Broadway"
Oct 1,2,3 Mozart's "Marriage of Figaro"
2003 Title Venue More info.